There are few plants so ornamental as several of the Yuccas, and yet we seldom see them employed in any conspicuous way, in our pleasure grounds or flower gardens. Here and there, perhaps, in the gardens of our curious amateurs, one sees a solitary plant, but beds, groups, and masses, never. Yet there are no plants so altogether satisfactory in many respects, as two or three species of Yucca that we can name. The Yuccas are mostly southern plants - the name Yucca being a vernacular appellation in St. Domingo. Some of the species, however, are natives of the United States - from Virginia to Florida, and far from being tender, they are hardier than many really northern plants. Yucca flaccida, angstifolia and filamentosa, bear a temperature of 10° or 15 below zero of Fahrenheit, and Y. gloriosa 6° degrees below, without being at all injured. As they grow with great facility in any rich, light soil, and are easily propagated by division of the roots, there is no reason why they should not be cultivated in every flower garden. April, and the first half of May, are the best season for transplanting the roots. 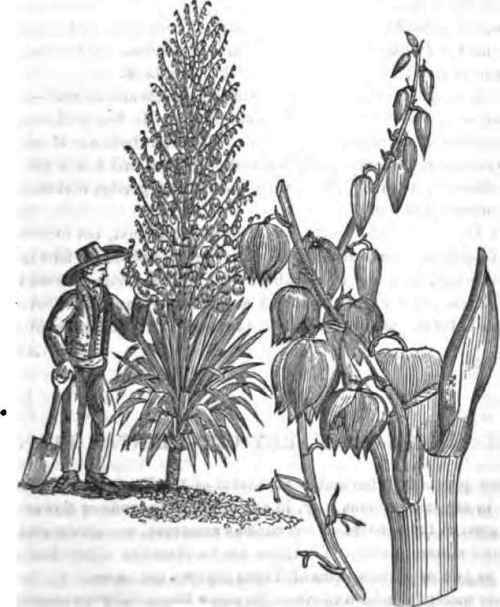 The Yuccas belong to the lilly tribe, in the natural system of botany, and the tall stem, (branched like a tapering pyramid,) of superb lilly-like flowers, of a creamy white color, that each plant throws up in mid-summer, forms one of the most remarkable embellishments of the flower garden or shrubbery. But a great merit of the Yuccas, over most herbaceous plants, is the constant beauty of the foliage, in fact of the whole plant, all the year round. The general appearance of the plant is not unlike that of the Agaves, or Century Aloes, (to which they are allied,) only the leaves are narrower - being only an inch or two broad. These leaves retain their deep green verdure summer and winter, and being systematically arranged on the plant, and handsome in themselves, they are as strikingly ornamental among the snows of winter, as in mid-summer. A winter garden, such as we have several times alluded to in these pages, would, beside evergreen trees, be most appro-priatelyplanted into beds or groups of Yuccas, to cheat the season out of its dreariness. We shall notice a few of the sorts most easily obtained at the nurseries, and most suitable for the gardens of the northern states. THE ADAM's NEEDLE,OR YUCCA GLORIOSA.